The War of Art is a book aimed at people working in creative fields, entrepreneurs, atheletes and many others. The focus of the book is around how to get past different kinds of resistance and blocks that are inevitable in these fields. The book attempts to help you get through these barriers. 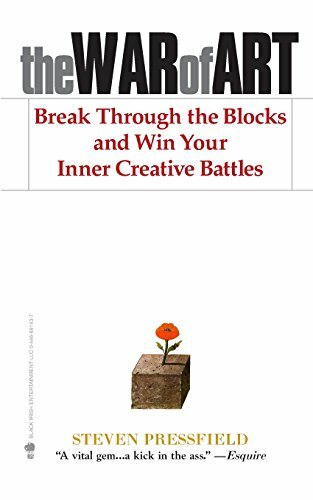 Rather than giving advice like "think positively", Steven Pressfield treats resistance like an enemy you are battling, so the book is essentially a battle plan to fight that enemy. Embrace fear. Embrace the resistance and fear you encounter. The more important a call or action is, the more resistance we will feel. If you do not fear doing something, then it doesn't mean anything to you. You get cold feet at a wedding, for example, because it is a meaningful commitment to you. Burnouts & Procrastination. Motivation always starts high when you start something new or embark on a new change. It will inevitably drop off as you find that it gets harder. At the lowest point of motivation where you stop seeing results from your venture, your resistance will be at its highest. It is at this point where you might "burn out" and move onto another project. Criticism & Jealousy. Resistance can surface as being jealous of others for being "luckier" than you or you might criticise others as a projection of knowing that deep down you are not on top what you need to be doing. Amateur vs. Professional. Classically, we think of amateurs as loving what they do because they do not seek to be paid for it. In the book, Pressfield argues that it is the professionals who truly love what they do -- more than amateurs -- because they show up every day without fail and commit over the long haul. Give your gifts. If you have some creative work to contribute to the world, then you are depriving the world of your contributions by not doing it. It is a powerful message that hopefully should give some more importance to what you are doing. Have you found this book useful in helping you get through resistance? Has it helped you get on top of what you want and need to do? If so, discuss your experiences in the comments below.